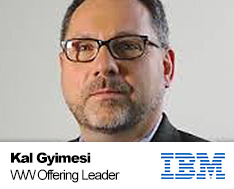 Kal Gyimesi leads the worldwide marketing strategy and deployment around solutions for the Automotive Industry at IBM Watson IoT. He previously led the development of new business research for Industrial clients, specializing in the Automotive Industry at IBM’s Institute for Business Value. He is the co-author for the recently released studies Automotive 2025: Industry Without Borders and A New Relationship: People and Cars. Mr. Gyimesi has over 20 years of experience leading the implementation of complex business solutions in the areas of supply chain solutions, RFID technology and the development of Demand Management offerings.